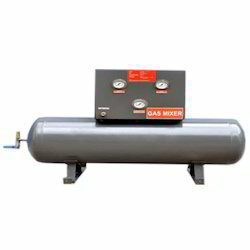 With the help of our deft and diligent professionals, we are offering a qualitative range of Gas Mixing Unit. The Bird™ Blender high flow features delivery of accurate FiO2 mixtures from two outlet ports and an overall flow range of 2 to 120 LPM. These capabilities optimally support use with ventilators while providing flows to a flow meter. It can also be used as a stand-alone device for mask CPAP, nasal cannulas and resuscitation bags. nice Neotech make one the best Oxygen Blander & Humidifier for any make any model of Ventilator. 99.99% satisfied customer. Prompt after sale service. At covai air products we provide on field gas mixing solutions with automatic software control for robotic welding and other auomated welding/cutting procedures. This equipment will be used for cardiothroacic surgery and this machine will take Air & Oxygen from Operation Theatre pipe and mix together and sent to Oxygenerator to purify the blood. 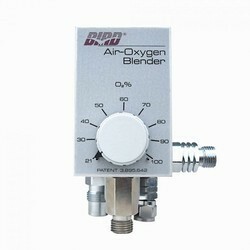 The Electronic Gas Blender EGB 40 is used to enrich air with oxygen. This gas mixture is fed to a gas exchanger or oxygenator.